All students are required to dress in the full SMR school uniform on their first day. For a complete description of the school uniform requirements, please review the Parent and Student Handbook and the descriptions below. SMR Campus Store: The campus store sells uniform polo shirts, boys ties for 9th and 10th graders, 1/4 zip uniform sweatshirt and gym uniforms. During the School Year, the campus store is open Monday - Friday from 7:45 a.m. – 2:00 p.m. During summer break, the campus store is open between the hours of 9 a.m. to 2 p.m. Please call 301.373.4192 to let us know if you plan to visit. 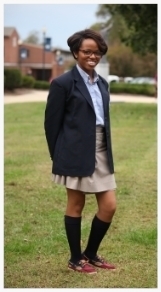 The Carousel Uniform Store: Located in Waldorf, MD or you may order online. Uniform Code = KNIGHTS (all caps). Flynn O’Hara: Located in Lantham, MD (exit 20) or you may order online. The summer uniform is worn August through mid-October, and from April through the end of the school year. An announcement will be made when the uniform season changes. The SMR 1/4 zip sweatshirt is permitted as part of the official school uniform. The sweatshirt may be purchased in the SMR Campus Store. The sweatshirt may be worn in place of the v-neck sweater and worn under the SMR blazer. Belt: Brown dress belt (solid, weave or khaki canvas/leather). Shorts: Khaki with SMR logo from the uniform company; white or black socks above the ankle worn with shorts. Must be fingertip length in the front and back. Belt: Brown dress belt (solid, weave or khaki canvas or leather). For young men and ladies, hoodies/sweatshirts: No sweatshirts or hoodies may be worn during the school day, either inside or outside the building. Flannel, denim or sweatshirts type materials are not allowed as outerwear. Hooded sweatshirts are permitted with game day attire representing the appropriate team logo from the team store, if the student is on that sports team or club. The winter uniform is worn mid-October through April. An announcement will be made when the uniform season changes. The SMR 1/4 zip sweatshirt is permitted as part of the official school uniform. The sweatshirt may be purchased in the SMR Campus Store. The sweatshirt may be worn in place in the v-neck sweater and worn under the SMR blazer. School tie: 9th and 10th graders must purchase a SMR tie from the Campus Store. 11th and 12th graders may wear an appropriate tie of their choice. Skirts: Khaki (purchased through the uniform company). Must be fingertip length in front and back. Skirts must never be rolled. Pants: Khaki with SMR logo from the uniform company. Socks must be worn. Blazer (11th and 12th): Navy blue blazer with SMR seal purchased from a uniform company. Optional SMR navy uniform sweater vest or navy quarter zip can be worn in conjunction with the uniform blazer. For young men and ladies, hoodies/sweatshirts: No sweatshirts or hoodies may be worn during the school day, either inside or outside the building. Flannel, denim or sweatshirts type materials are not allowed as outerwear. Hooded sweatshirts are permitted with game day attire representing appropriate team logo from the team store, if the student is on that SMR team or club. Please refer to the Student Handbook for additional information regarding the student wardrobe policy.